These meditations, one for each day of the year, speak to the common experience, shared struggles, and unique strengths of a woman, especially those seeking support and spiritual growth in recovery. Each day holds its promise, and life’s journey begins anew. Find inspiration and guidance for dealing with the challenges and new experiences of recovery in the writings in Each Day a New Beginning–from a woman who cares about others. 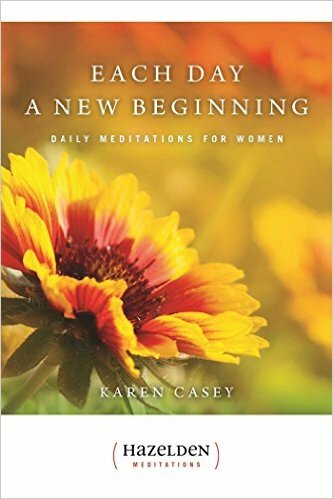 Beloved author, Karen Casey, writes about self-esteem, friendships with other women, hope, attitudes about life and relationships, and more. Her words help bridge the gap between self and Higher Power, between loneliness and sharing the emotions of recovery.Each day’s message begins with a quotation–from such exceptional women as Agatha Christie, Annie Dillard, Beverly Sills, Helen Keller, Maria Montessori, Adrienne Rich, Katharine Hepburn, Amelia Earhart, and many more–and ends with an affirmation, marshaling the feminine courage and spirit, wisdom and wit that make every day count.Almost three million recovering women turn to these meditations each day.